More scary fun from Newton's Nook Designs and the Boo Crew stamp set. Oh wow how clever this is Tammy!! I adore the bat filed sky and the peeking ghosts cats trying to be scary!! :) So fun!! Spooky cats! 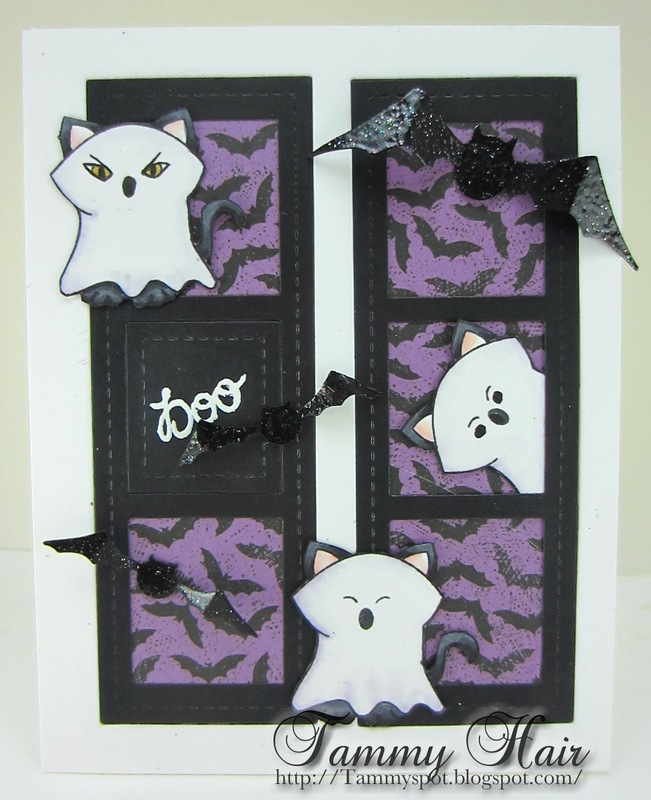 !...now that is spooky...cats hide in corners and jump onto your legs when you are passing..fabulous card Tammy..brilliant design. CUTE way to use the frames that way. I like the two on one card! Those cat ghosts are so cute. Surely they won't scare anyone. Precious card! That top left kitty looks really mad - LOL. Fun cat lover card. What a delightful windowpane design with your bat paper and well-dressed cats!! Super cute for Halloween!